Ellen Hutson is having their January "Mix It Up" challenge at The CLASSroom blog. The partner company this month is Avery Elle. I used Avery Elle's "Berry Good" stamp set & one of the coordinating dies along with the "Bokeh Dots" stamp set from the Essentials by Ellen line. For my design, I turned to Sketch #SC613 from Splitcoaststampers.com. I stamped the peach from "Berry Good" in Versafine Onyx Black ink onto a scrap of Strathmore Smooth Bristol paper, and stamped one of the greetings inside. Then I heat embossed it with Recollections Clear Detail embossing powder. I used my Zig Clean Color Real Brush markers to color it. Finally, I die cut it with the coordinating die. To create the background, I used the 3 scribble circle stamps from "Bokeh Dots" & Hero Arts Fresh Peach ink. I cut a piece of a light peachy-colored cardstock, to create a tone-on-tone background. I stamped my first, largest circle roughly where my focal image would go, intending it to be a kind of frame for the peach. As it turned out, the strips & peach cover most of that circle, so the frame idea didn't really pan out. But it was a nice idea anyway! :) I continued stamping the 3 circles, moving from the largest to the middle to the smallest, randomly around my A2 size panel. For my strips, I cut 2 strips from a yellow-green polka dot patterned paper that I found in my scrap stash. I also backed 2 strips of a bright chevron washi tape (Recollections brand) with white cardstock (so they would be opaque), and cut them to the lengths in the sketch. 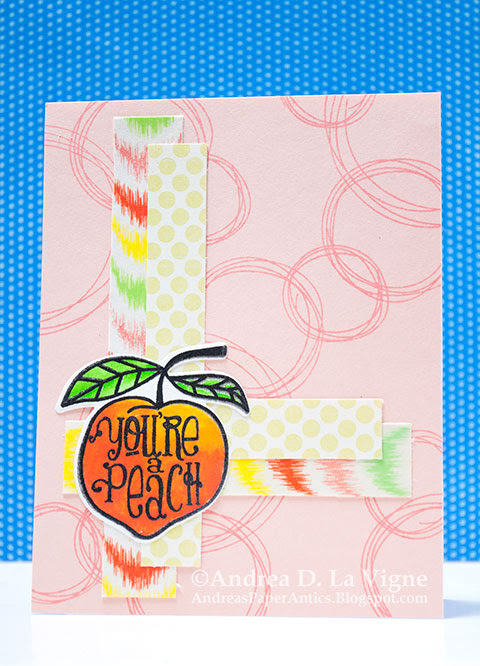 I adhered my strips according to the sketch, placing the chevron ones so they "pointed" to the peach. Then I glued my peach where the strips intersected. Finally, I mounted my card front to a white A2 card base. I'm sending this to Send a Smile 4 Kids, to go to a child who is an inpatient in one of the children's hospitals they serve. Creative Knockouts #175: "Anything Goes"
613 Avenue Create #193: "Anything Goes"